Most individuals do not associate the South Pacific with scenes from Dicken’s A Christmas Carol or other observances associated with the holiday season. However, between Australia, New Caledonia and New Zealand there lies a small island about 14 square miles in an area that has given us a very attractive houseplant that can double as a living Christmas tree. As its common name implies, Norfolk Island pine is endemic to Norfolk Island and possesses arboreal traits similar to those of our native evergreens. Norfolk Island pine carries the scientific name of Araucaria heterophylla and is a member of the Araucariaceae family. Although the plant family to which it belongs occurs only in the southern hemisphere, its close morphological similarities to members of the pine family (Pinaceae) caused early explorers to give it its common name. Since Norfolk Island pine is a tropical plant, it cannot endure our winters outdoors and must be treated as an interior plant. In its native habitat, it can grow as much as five feet per year and achieve a mature height of over 200 feet. Indoors, however, its growth is much slower because of the more austere environmental conditions typical of most homes. Its graceful, horizontal branching habit and soft green color of its needles make this plant a very attractive candidate for decoration. Indeed, some have dubbed a well-kept specimen of Norfolk Island pine as “the ultimate interior tree.” For individuals wanting a small holiday tree, plants of several sizes are commonly available for purchase during the holiday season. Most of these plants have been grown from seeds. Therefore, overall shape as well as spacing of branches sometimes vary between plants. Those plants with dense, more closely spaced branches develop into more attractive larger plants. However, the retention of plant form in the home greatly depends on the growing conditions. As an interior plant, Norfolk Island pine requires goodly amounts of light. Most interior plant authorities place it in the “high light” category whose members prefer between 500 and 1000 f.c. of light. Several hours of direct sunlight daily is desirable, although bright, indirect light usually results in satisfactory plant growth. In poor light, terminal growth may cease but branches often continue to grow. This results in a short, broad plant of lesser ornamental appeal. Also in poor light, the branch tips become weakened and tend to droop. At each node on the stem of Norfolk Island pine, five to six branches should develop as the top grows. If fewer are produced, additional light (if possible) should be provided to encourage better growth and plant shape. The growing medium for Norfolk Island pine should be highly organic and well-drained. Media consisting of a blend of peat moss, vermiculite and perlite work well. The growing medium should be kept continually moist but not wet for best plant performance. If plants are not provided with adequate moisture, lower branches will droop and not maintain their horizontal form. The droop that is a result of wilting differs in location from the droop at the ends of the branches that result from inadequate light. If the plant remains dry over an extended period of time, its lower branches will turn brown and fall off. Conversely, excessive amounts of water can lead to plant death because of root rot. When water is required, apply sufficient amounts to allow a little excess to drain through the holes in the bottom of the container. Make sure to discard excess water after drainage has stopped. Houseplants such as Norfolk Island pine need only modest amounts of fertilizer, especially during winter months when light is poor. Feeding about once every four weeks in winter usually is adequate. An alternative is to feed on a more regular basis with a very dilute fertilizer solution. The labels of most fertilizers formulated for interior plant use give directions for both types of feeding. As mentioned previously, Norfolk Island pine makes an excellent living Christmas tree. If used for this purpose, avoid decorating with lights that get hot. The latter can burn tender needles and cause permanent damage. LED lighting is ideal since they remain cool when illuminated and are light in weight. Also, avoid the use of heavy ornaments which might tend to bend the branches downward. When branches have been weighted in such a manner for an excessive period of time, they lack the ability to “spring back” to their original orientation. The end result is the symmetry of the plant will be ruined. 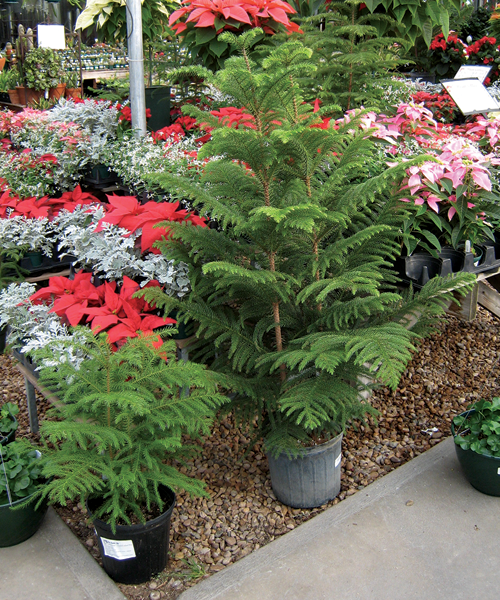 It is typical for garden centers and mass merchandise outlets to offer an impressive selection of Norfolk Island pines at this time of the year. Sizes ranging from compact desk or tabletop plants all the way up to floor plants that rival a traditional Christmas tree in height often can be found. Select plants that are vigorous, healthy and of good plant form. It is not unusual for a newly purchased plant to drop a few needles when it is introduced into the home. The plant is “acclimatizing” to it new environment and lower light conditions. Needle drop should stop once the process has been completed. Given proper care, a Norfolk Island pine purchased this holiday season can give many years of enjoyment to its owner. Repotting to a larger container usually is not necessary for three or four years, depending upon growing conditions.